Cambodia strongman Hun Sen swears on his life that vote numbers not inflated, says he will address U.N.
PHNOM PENH - Cambodia’s strongman Premier Hun Sen Monday rejected claims the results from last month’s widely criticized election had been falsified, saying he would stake his life on their accuracy. Hun Sen’s Cambodian People’s Party claimed it won all 125 parliamentary seats in the deeply flawed July 29 poll, cementing the country as a one-party state and extending his 33-year grip on power. Opposition figures had called for a boycott of the vote after the main opposition Cambodia National Rescue Party was dissolved last year in a crackdown that saw one of its leaders charged with treason. Turnout was a whopping 82 percent, leading Hun Sen to dismiss the campaign to shun ballot boxes as a failure. But independent observers did not take part and rights groups pointed to voter intimidation. In a speech to athletes in Phnom Penh, the bombastic Hun Sen, 66, denied “vote cheating (and) inflating figures” of turnout. He dared opposition leaders to join him and swear on their lives over the claims. “Those who have alleged the figure (of turnout) was inflated, please swear. Swear to die all together,” he added. 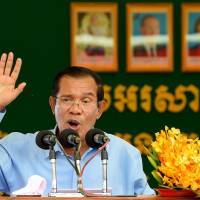 Hun Sen also said Monday he will give a speech to the United Nations General Assembly. He said he would travel to the United Nations if his new cabinet is formed by August to show the world that Cambodia does not need outside approval. “I will go to the United Nations to make a speech for you to see that as a sovereign state, which held its own elections, we don’t need stamps of approval from anyone,” Hun Sen told the gathering of athletes. 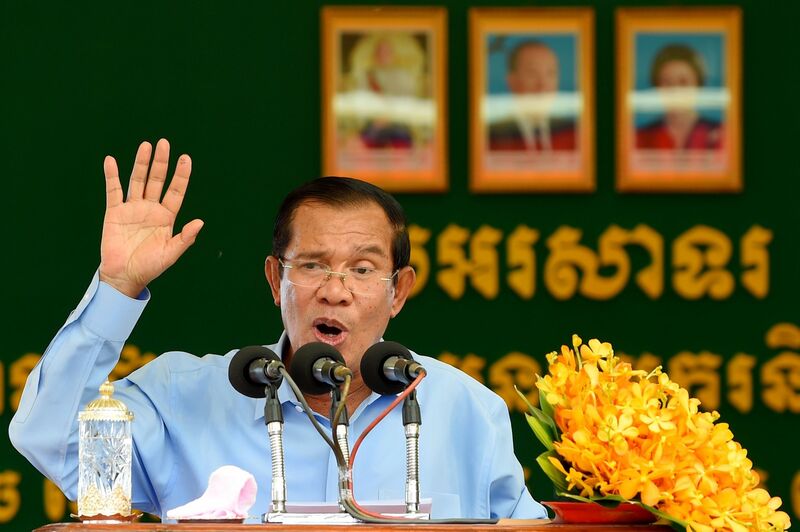 Hun Sen last gave a speech to the U.N. General Assembly in September 2015, where he called on developed nations to fulfill their foreign aid pledges. A U.N. representative did not respond to a request for comment on Monday. Hun Sen said the National Election Committee will announce official results on August 15 and that, if there are no complaints, a new government will be formed in August. The European Union also condemned the election, while China congratulated the people of Cambodia. The CNRP took 44 percent of the vote in the previous election in 2013, mounting the most credible challenge to Hun Sen in decades. It performed equally well in 2017 local polls.